Thanks Vogue Knitting Live & NYC! We’ll be seeing you again soon! A couple of weeks ago JazzTurtle Creations hit New York City for Vogue Knitting Live and it was one of the most incredible trips we have taken! The event was held at a lovely Hilton on 6th Ave, near Rockefeller Center. It was a bonus that the best voted Hallal cart was set up across the street! Some of the best gyro I’ve ever had! We dropped our stuff off on Thurs morning, thanks to the most amazing bellhop ever! 5 cart trips and we had EVERYTHING upstairs.. including the gridwalls! After we got everything up to our booth, we headed over a couple of blocks to our hotel. It’s a lovely small “boutique” hotel with 40 small rooms! It was quite a perfect set up.. with free pastries and juice in the morning, and free wine and cheese in the evening, and a lounge open all the time with hot chocolate and coffee and even hot cider! The bonus was the free internet! We decided that with the wonderful help we were going to have, we would set up the next day and just spend the rest of the day resting up for the weekend that was ahead. We were SO excited that the Original SoupMan (otherwise known as the SoupNazi from Seinfeld) was located just 3 doors down from the hotel. We ate there almost every day! That afternoon we shared butternut squash soup and lobster bisque. YUM! Thurs night was also our “date night” in the City. We had reservations at a wonderful old school Italian restaurant near the hotel called Patsy’s. Bryan had gnocchi and I had a trio of ravioli with 3 different sauces. We were on a roll with good food, and we’d only been there a few hours! After dinner we went into the theater district and saw “How to Succeed In Business Without Really Trying”. This is a great song and dance show! I’d seen it in 1995 with Matthew Broderick and I was excited to see it again with Darren Criss (from Glee) in the same role. Beau Bridges was also in it and we were really looking forward to a night on Broadway. The show didn’t disappoint and we had a wonderful time! We had a lovely walk through Times Square back to the hotel for some much needed sleep! We were so lucky to have some good friends come into town to help us with such a major event! The extremely talented Deb Lambert, of Picasso Moon Yarn Shop in Sarasota came and brought her amazing knit creations, and Arlene Ciroula and Kathryn Benavides came to sit and knit and help in the booth as well!! 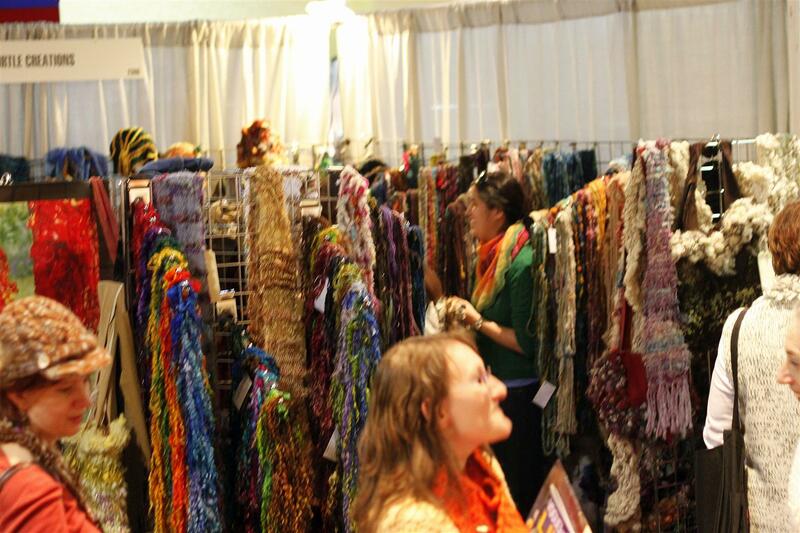 Having all these amazing knitters around was so inspiring for the folks coming into the booth!! Deb was working on some large textured shawls and Kathryn was knitting some of the most amazing sparkly socks with yarn she spun from some of my batts this past summer!! Deb came early and was able to help set up the booth Friday morning. Bryan brought over Carnegie Deli HUGE corned beef sandwiches for lunch! YUMMY!! We were set up in time for me to borrow the shower in her room and come down to an open marketplace fresh and excited! We got such a great response that first night! Nicky Epstein stopped by right away and told me she’d be back by the end of the weekend because she had some ideas for my yarns!! After the few hours of the initial preview we were ready to go back to the hotel and REALLY excited for the rest of the weekend to come! We picked up some soup on the way up to the room (more lobster bisque!) and then Bryan picked up the best NYC pizza! It was thin and crispy and SO GOOD! We were exhausted, so it was perfect! Saturday and Sunday ran the same as Friday night! The show was packed! 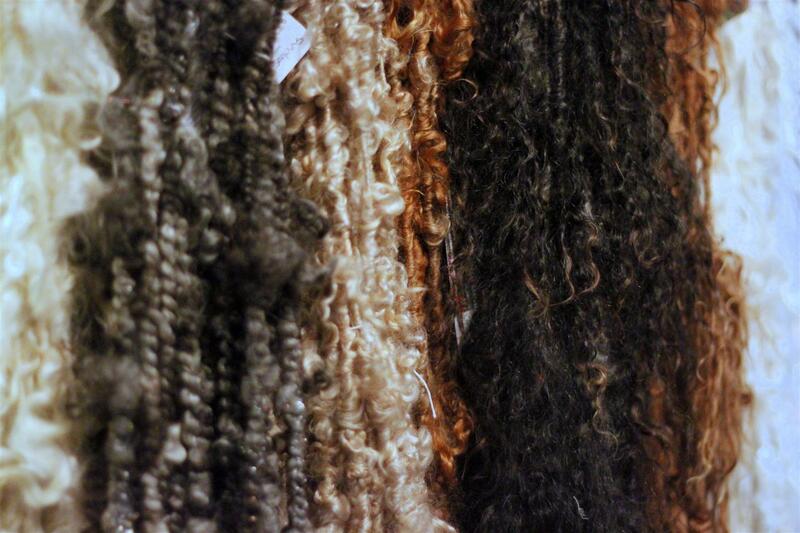 The new collection “NakedSpun” yarns were extremely popular! 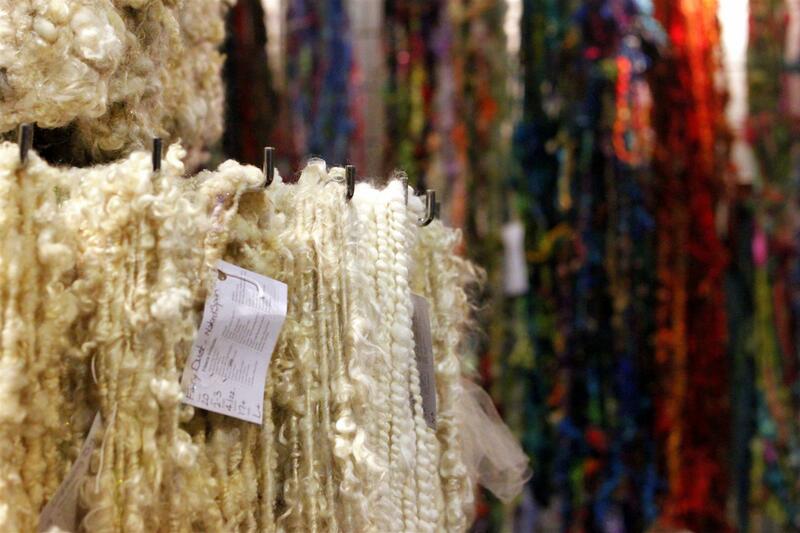 They are a true celebration of the natural beauty of the fiber!! 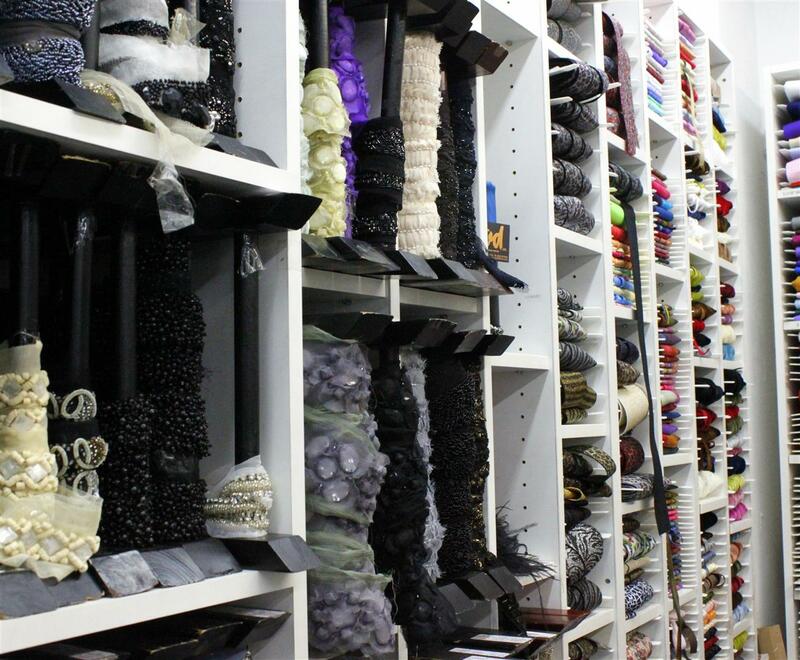 A wonderful yarn shop called, Knit Stop, in Indianapolis IN got a large order of yarns for their shop! I got to see some of my vendor friends (Steph Gorin of Loop, Rin Gill of HappyFuzzyYarn, Diane Lutz of Creatively Dyed) and I met wonderful NEW vendor friends! I was approached by a fiber radio show/blogpost to give an interview, Where Women Create magazine to do a feature interview.. Designers purchased my yarns for projects and at the end of the weekend Nicky Epstein did come and get 3 skeins to work with for future projects. We ate gyro from the cart across the street, more NYC pizza and of course, more soup! Load out was a bit crazy on Sunday with a HUGE HUGE HUGE Chassidic wedding taken over the hotel- and all the vendors trying to pack up and get out at the same time! Luckily Al was working once again and with Deb’s skills, we were broken down 30 min after the show ended and Al had us loaded out of the building 30 min later. (now.. Bryan getting down the street with the van took a bit longer.. but that’s NYC cops for you….) Sunday night we were SO tired that after showers we ordered Thai from the restaurant on the corner near our hotel- and they even brought it up to the room! It was SO GOOD! The peanut sauce was incredible!! We slept SO WELL that night.. in a state of bliss from the weekend’s activities. Monday was our “fun” day. Since we had so many helping out at the booth, Bryan was able to do a bit of City exploration earlier in the weekend. Together we went to Chinatown for some authentic Dim Sum from a large Hong Kong DimSum house. It was SO good! 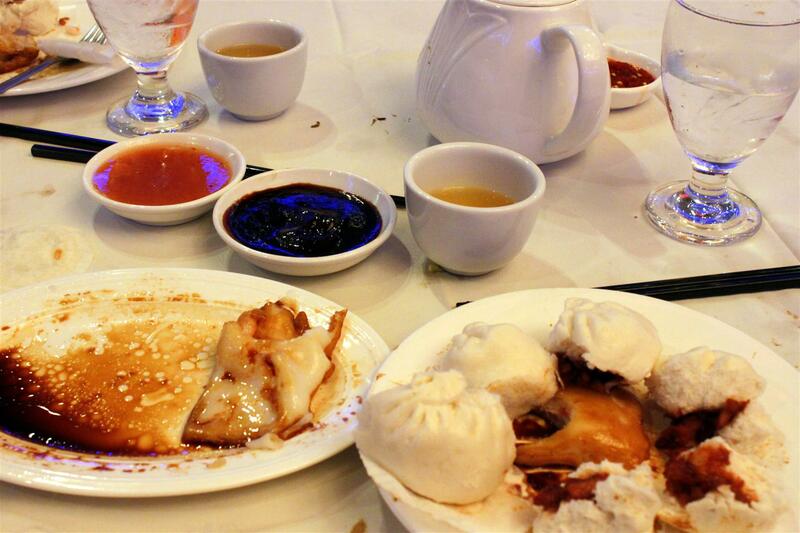 I’ve been eating DimSum since I was a little girl and this was some of the best I have ever had! For the first time I had a wonderful soft shell crab with a soy ginger sauce that was so good I’m drooling just thinking about it again. BBQ pork buns, shrimp noodles.. everything was wonderful! 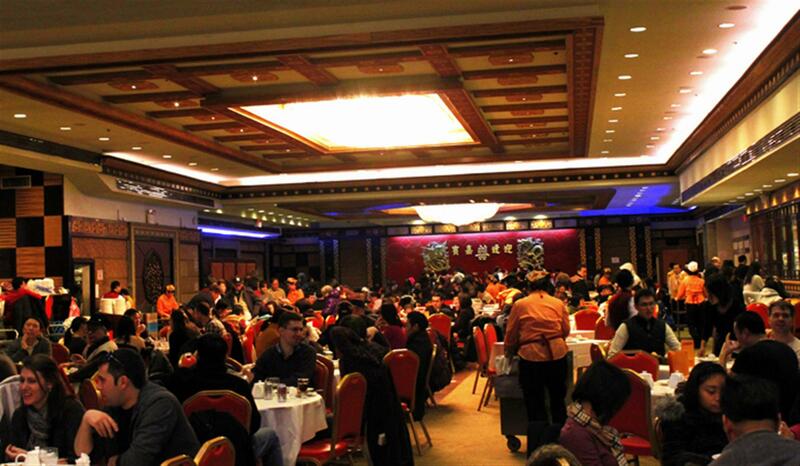 The restaurant was HUGE and bustling! Small parties shared tables. There were so many carts, you had to walk around the restaurant to make sure you were getting everything you wanted! After lunch we went down to the 9/11 Memorial. It is a truly profound place with very tangible energy. The place is full of construction of new buildings, the 9/11 museum and the security hub underground.. yet with all the activity, the memorial is very still and quiet. It’s quite intense. There is definitely a*heavier* energy at the South Tower pool.. which is where such a large number of the civilian deaths were. 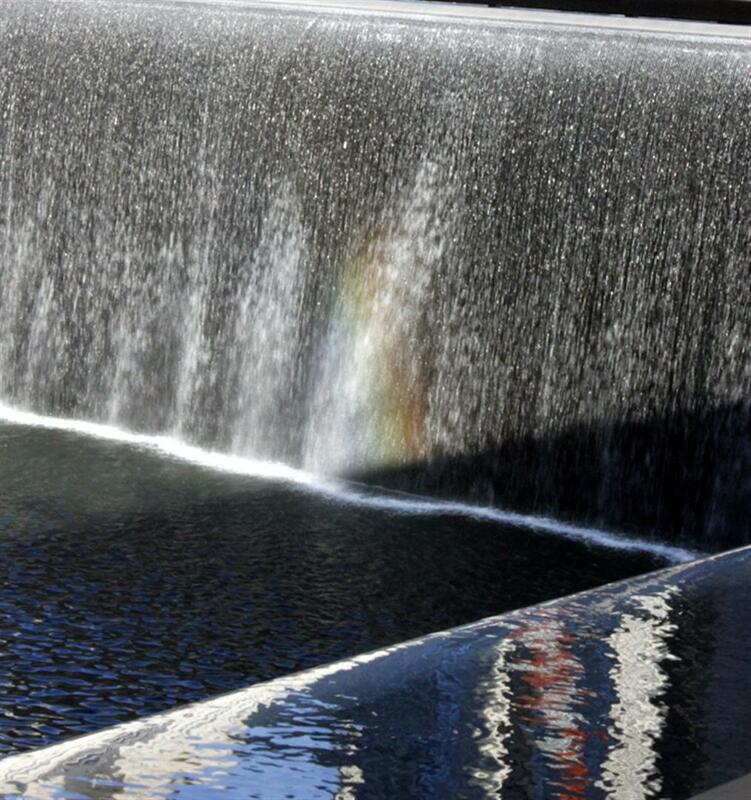 Bryan was able to catch a rainbow in the spray of the waterfall. A little bit of beauty in the heaviness. I was very glad we went during this construction time, and I look forward to going back once the museum is open. 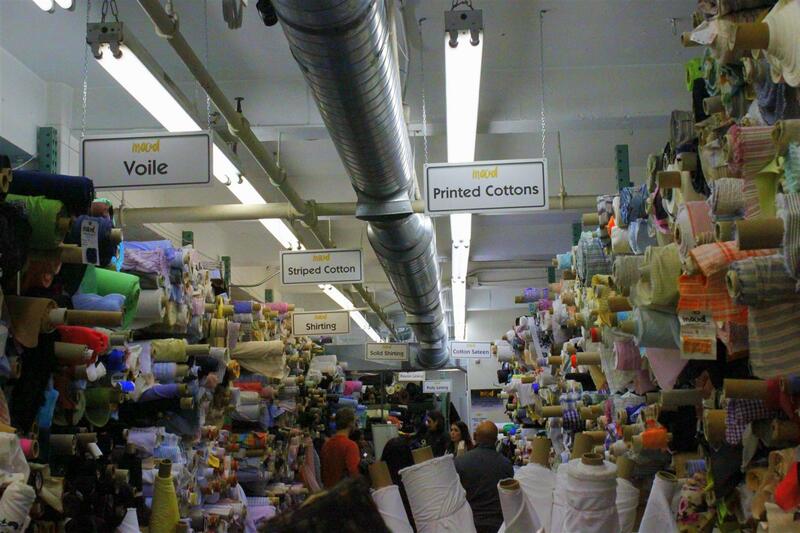 After the Memorial, Bryan was so wonderful to let me have the best “me” experience… we went to Mood Fabrics (where the contestants shop on Project Runway). 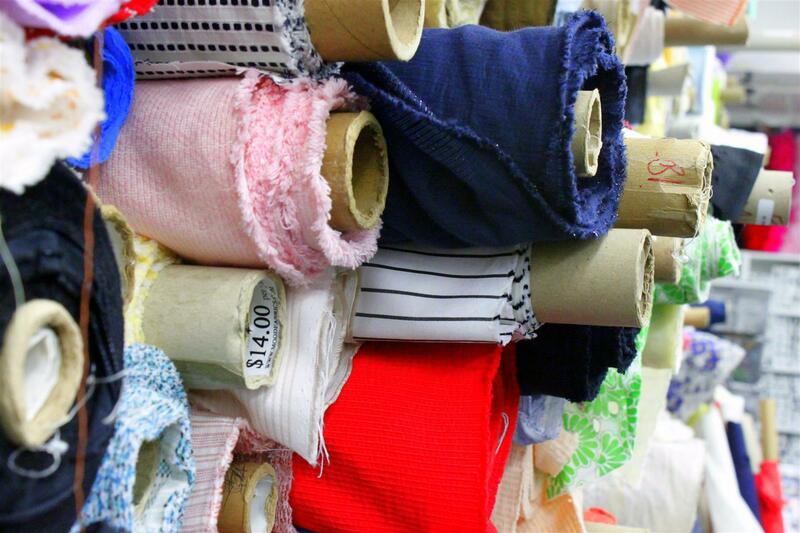 It was a plethora of color and texture…. 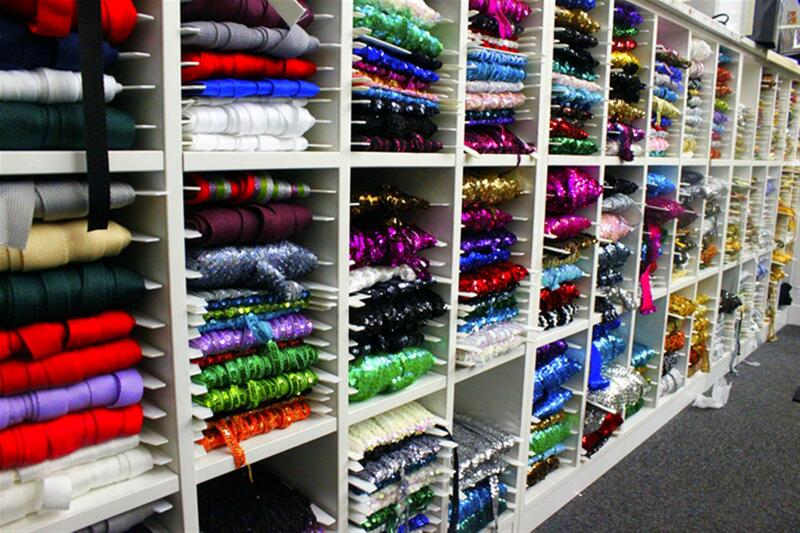 and if I let myself I could’ve spent my entire VKL profit.. trims, sequins, crystals, buttons, feathers…. I was in heaven! Really, the choosing was the hardest part, but I allowed myself one cut (1 yard min) so I picked out (after much running up and down the stairs to the different fabrics) some amazing woven fabric with sari silk yarn woven into raw silk. I’m not sure how I”m going to use it yet. It was SO hard picking what I wanted! The trims were so incredible.. 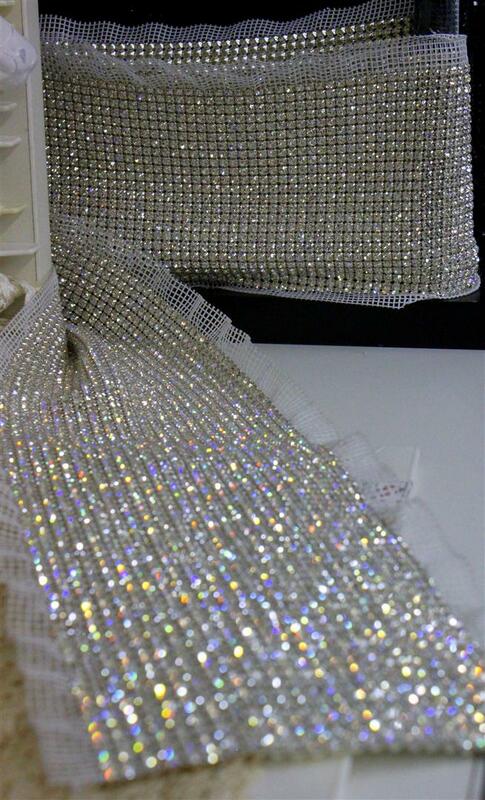 The 3 inch wide swarvoski crystal trim was so amazing it gave me shivers just looking at it.. 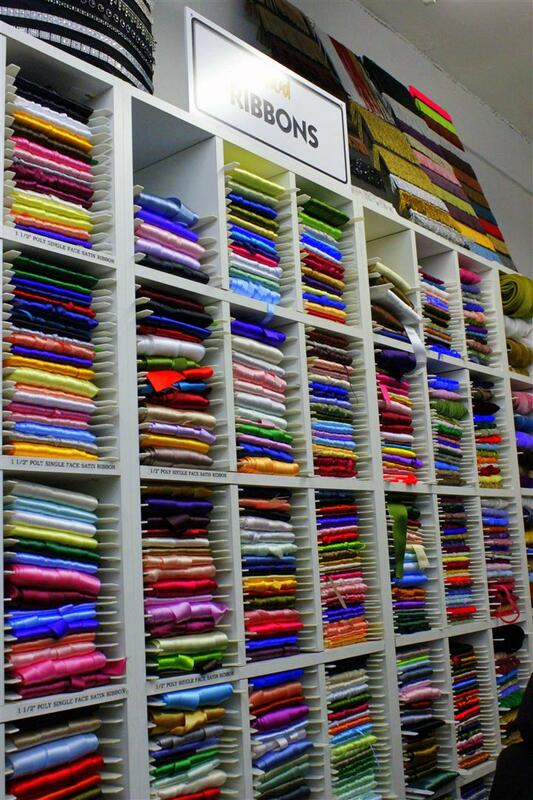 Unlike many fabric stores, Mood doesn’t have a remnant “section” But after much searching and asking- I found the remnants! It’s just a few bins under the stairs.. but they were there!!! I got yummy leather pieces (red suede, brown suede, eggplant ultra suede and black super soft leather), I found a ‘closeout’ piece of steely grey velvet with green paisley print, and then some silk brocade remnants.. and my SCORE of the day.. a half yard piece of chiffon/cashmere ARMANI fabric that was discounted due to some minor “damage”. It’s totally perfect for an amazing nunofelting!! One of the best parts about our Mood trip was Swatch the dog! Swatch is the “store mascot” and he’s so very cute, friendly and incredibly well behaved. He comes when the store employees whistle, and you can often see him running around in the background when the designers are scurrying around on Project Runway! 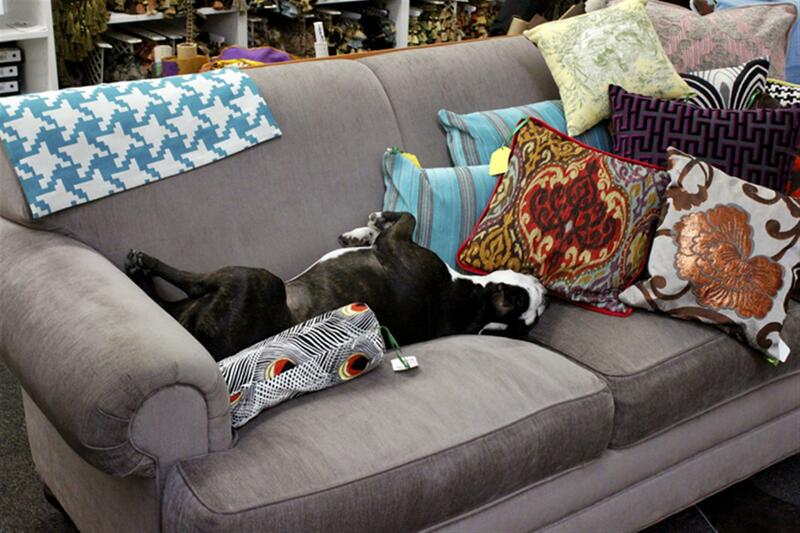 Bryan was sitting on this same couch only a few minutes before and was asked to get up because how close he was to the designer pillows.. however only moments later when Swatch jumped up to take a late day snooze no one said a word- other than how cute he was! So once again, the animals run the show! After another amazing day we fell back to our hotel.. we ordered burgers from a restaurant the hotel recommended.. and once again they came right up to the room. I got a ‘regular’ burger and Bryan got a “Sans spuds” burger with sour cream, chives, bacon, cheese.. and let me tell you these were some of the best burgers EVER! I don’t know what they did to their fries.. but they were amazing! AND they had roasted asparagus with Parmesan cheese and balsamic vinegar! Also fantastic! and milk shakes.. again.. fantastic! We fell into an amazing sleep.. and we slept until we woke up with no alarm or wake up call! We got on the road and had a long journey home.. so around lunctime we were not far from Baltimore. We stopped in a little town off the river that feeds out of the Chesapeake Bay, called Havre de Grace. We found a small restaurant that was obviously a local joint, called Price’s Seafood! We walked in and they had paper on the tables.. I knew I was happy!! FRESH steamed crabs!! Happy happy happy!! Our “quick” meal turned into a couple hours of amazing food and conversation! We got home later than expected but happy and excited! 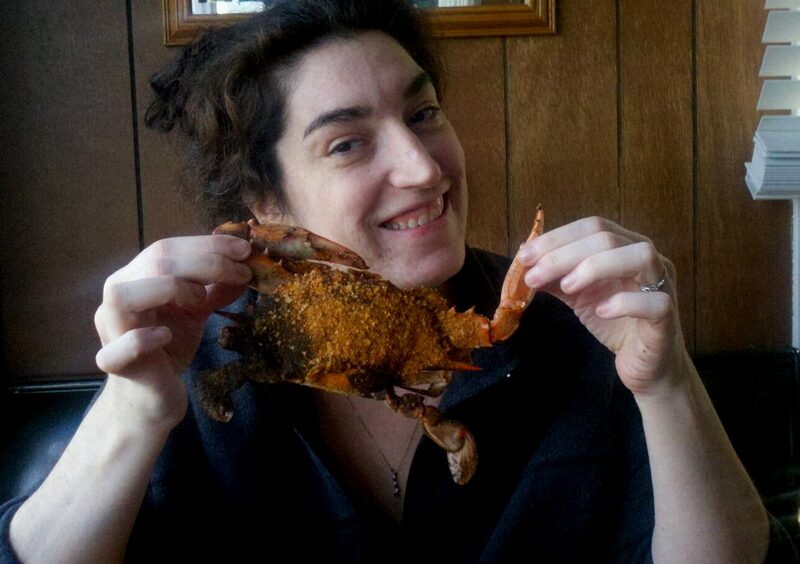 I’m still dreaming of Price’s crabs and I can’t wait until our next trip to New York City! Now that we’re home I’ll get to updating the shop with the yarn we have left over! Also will work on getting ready for the trunk show with Lexi Boeger and the celebration of her new book at Downtown Knits on Feb 17! This year there’s SO much great stuff going on! I can’t wait for the next big event! ← JazzTurtle is coming to New York City! Hello Vogue Knitting Live! I like how you travel… Food and Fiber! My kinda trip!